If you’ve been homeschooling – or even considering homeschooling – then you know that the first question “concerned” people ask is, “What about socialization?” Because of this, one of the most common questions asked in homeschooling groups is, “so what can my kids do as a social activity?” Rest assured, there are many activities for homeschoolers to participate in (in fact, I feel like there are more activities available for homeschooled kids than there are for their public and private school counterparts). 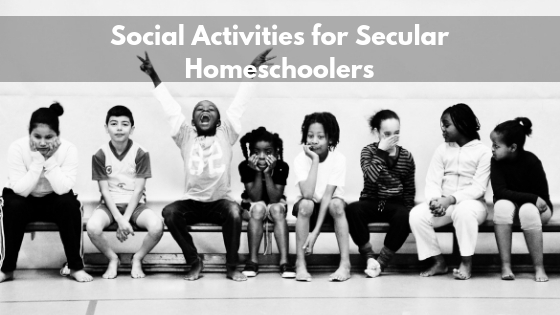 Secular homeschoolers often run up against the wall because many activities appear to center around church groups, and many homeschooling groups are religious in nature (particularly Christian). Some groups, co-ops, and sports clubs for homeschoolers may even require a signed statement of faith. What’s one to do, then, when seeking out secular activities for children who are homeschooled? Here are some ideas. There are the two main scouting organizations – Girl Scouts and (Boy) Scouts*, and then some lesser-known scouting organizations. We’re heavily involved with Girl Scouts (I just signed up to co-lead my daughter’s troop), and since I also was a Girl Scout, I’m partial to the organization. My little guy is too young for Scouts as of yet, but when he’s old enough, he’ll join a Den. Other scouting organizations include: Navigators USA, Frontier Girls, SpiralScouts, and Campfire. Scouting helps build confidence, STEAM knowledge and skills, outdoor skills, leadership skills, and life skills. If you know of a scouting organization I haven’t mentioned, please share it in the comments. 4-H is another youth program that encourages skill development. 4-H programs cover STEM, agriculture, healthy living, and citizenship skills. There are no uniforms and no national fees, and projects can be selected to work with your family’s budget. 4-H programs are available for kids 8-19, and there’s a junior program available called “Cloverbud” for ages 5-7. Our area has a number of neat museums and two zoos – one local and one with in 30 minutes. They all offer various learning opportunities and classes for homeschoolers. Don’t limit yourself, though. See what programs your local museums and zoos have and take advantage of them. Even if a program isn’t specifically for homeschoolers, it will be a great opportunity for your young student to learn and interact with other kids with similar interests. Most libraries have a variety of programs – from storytimes for younger children to LEGO events for older children, there’s a variety of possibilities for kids to meet other kids at the library who are into the same things as they are. Some libraries even have homeschool group meetups. We’re very lucky. Our Parks and Recreation classes cost as little as $9 a session, and most are around $20. All three of our young children take advantage of classes like gymnastics, art, and dance and basketball clinics. Be sure to check out opportunities near you for affordable classes. They’re particularly great for having kids get their feet wet in one activity without making a full commitment. Many of the gyms around us have homeschool days. Some even host sports teams for kids outside of school. We also have a lot of different sports leagues to choose from (benefits of being in a city). Call around, you may be surprised at the opportunities offered in your area. Here, we have galleries and studios offering some homeschool art and music lessons. This can be a great opportunity for getting out there and learning an extracurricular skill in the arts. Don’t overlook local theatre companies. My oldest found his passion in theatre by joining the local independent theatre company’s youth company. On that note, don’t forget to check out local dance studios, art galleries, and children’s choir and orchestra opportunities. My 5 year old took violin lessons that were both group and solo from a music professor through the local university. Many colleges and universities offer programs for children through their various departments. Years ago, my oldest took a series of science courses aimed for late elementary and middle school students through the local university. As if you didn’t already have enough options already, each community usually has a group of homeschoolers or kids that meet up regularly. There are also board gaming clubs, extension programs, and co-ops. If you find that your local area doesn’t have a secular-friendly group, don’t fear. Put out some feelers on social media. Chances are, there are other parents like you who would like to meet up with secular-minded families. So, when someone asks you, “but what about socialization?”, you now have a set of answers. In my community, there are more options and opportunities that any one family could ever reasonably participate in. I turn the question on you, now, what activities do your kids participate in? Posted on April 8, 2019 by Ronda Bowen	• This entry was posted in Homeschooling Life. Bookmark the permalink.